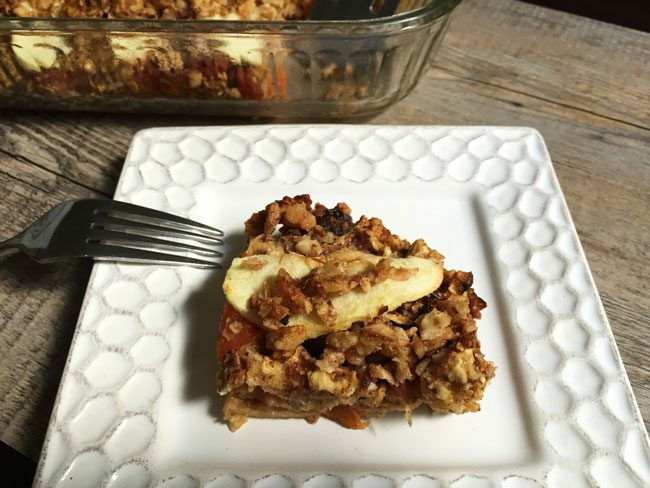 This apricot apple matzo farfel kugel was inspired by a reader who loved my first kugel recipe posted in 2013. If you like a kugel with a touch of sweet, tart and crunch, you’ll love the apricots, apples, and crisp-like topping in this recipe. Find more of my Passover tips here and matzo recipes here! Making this online connection with Phyllis was priceless and she really did send me the recipe! Inspired by Phyllis’ 40 year old Good Housekeeping recipe, especially her notations on it, I developed this new recipe using what I hope is the best of my 2013 version and hers. 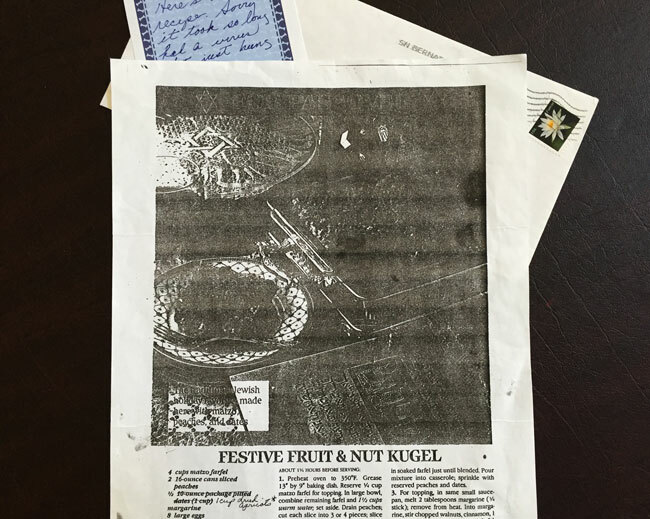 Phyllis’ version of the Good Housekeeping recipe substitutes dried apricots for the dates (I love dates but the apricots add a lovely tartness that really zings up the kugel). Plus it uses a crunchy matzo nut topping. This nutty crisp-like layer adds terrific texture as a counterpoint to the moist and soft interior. I chose to keep this kugel non-dairy except for butter. For anyone keeping kosher, stick with your butter-substitute of choice. In addition, I always feel that Passover meals tend to be very egg and matzo heavy. So I attempted to keep the eggs at a minimum (4) and used applesauce and some flaxseed meal to augment moisture and to bind it together, subbing for what would have been an additional 4 eggs. These two substitution suggestions are frequently used for vegan baking (no eggs). 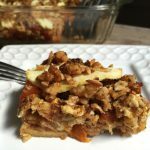 These two changes worked beautifully – the applesauce added moisture and flavor and the flaxseed added nutrition and held the kugel together perfectly. If you have no issue with more eggs, absolutely use more. But I would strongly suggest at least using the applesauce in place of two of the eggs for the moisture and flavor. 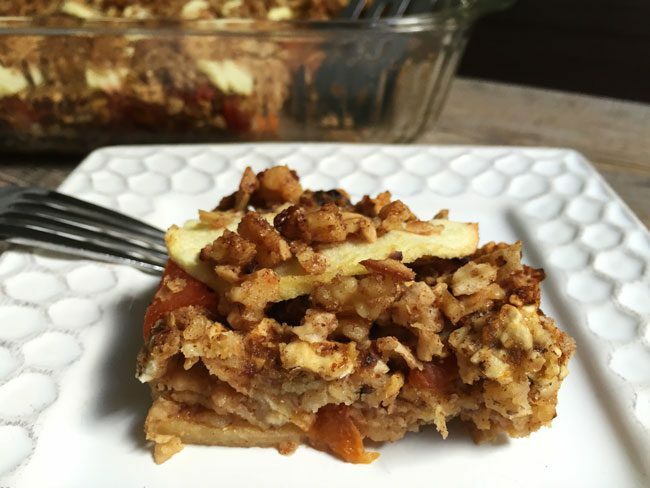 So without further delay – here is the reader-inspired Apricot Apple Matzo Farfel Kugel with a Nutty Matzo Crunch Topping. 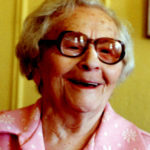 And thank you so much Phyllis for the inspiration! 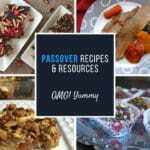 For even more Passover recipe inspiration, check out my Recipe and Resource Guide for Passover. Inspired by the huge interest in my first kugel recipe posted in 2013 and a wonderful 40 year old recipe I received from a reader, I created this new version adding tart dried apricots, reducing the eggs if desired, and using a crunchy nut and matzo topping. Preheat the oven to 350 degrees and grease a 9 X 13 baking dish. 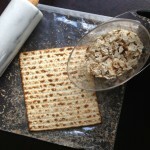 Instead of buying pre-made farfel, simply place the matzo boards in a ziploc bag and use your rolling pin to break them up into little pieces. 2 boards will yield about 1 cup of farfel. Beat 2 of the eggs and mix with the farfel and a teaspoon of the salt. Heat a skillet to medium low, add the two tablespoons of butter (you can skip the butter here if you want) then add the egg farfel mixture, mixing frequently to be sure the pieces brown and separate. You can walk away from these while they cook but return frequently to mix and separate the farfel. Once the egg is set, pieces are mostly separate and a little darker, set the farfel aside while you prepare the apples and wet ingredients. Peel, core, and thinly slice the apples - sprinkle with a bit of lemon juice to keep them from browning. In a medium bowl, beat the remaining 2 eggs with the sugar, 1 teaspoon of salt, 1 teaspoon of cinnamon, 1/2 teaspoon of nutmeg, and 4 tablespoons of the melted and cooled butter or margarine. Add in the applesauce, flaxseed mixture, toasted farfel mixture, and the dried fruit and it's soaking liquid. Mix until well combined. In a small bowl combine all the matzo crunch topping ingredients and mix well. 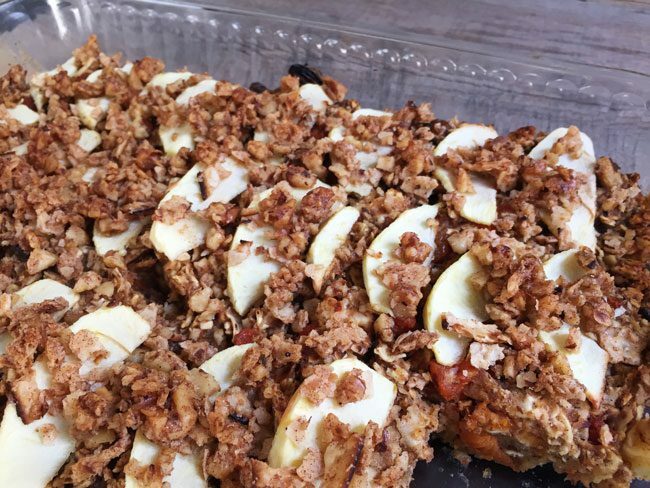 In your greased baking dish, layer 1/2 the apple slices and sprinkle with a dusting of cinnamon if you'd like (optional), then add the matzo farfel mixture and then top with the remaining apples. Then sprinkle with the matzo nut crunch topping. Bake for approximately 40 minutes. (should get crunchy on the top and see it bubbly on the inside). You can make it ahead but be sure to reheat in the oven so the crunch returns to the topping! This came out a bit dry for me – but I’m not a great cook. Where do you think I went wrong? Followed the ratios very closely :/. You may have done nothing wrong Danielle :-). 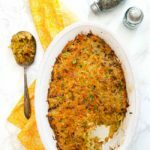 I just made it the other day and it was super tasty – I really love the crunchy stuff on top especially and the apricot flavor – but it was a touch dry as well. Did u remember to put in the liquid from the dried fruit (cuz I almost tossed it!). I’m also thinking it depends on the juiciness of the apples and how many you use. I was thinking that if I cut the apples thinner, the same amount of apples can go farther but it would mean less apple in the dish overall (does that make sense). I am making it again this Saturday and will pay close attention again to see if I can offer up any notes for next year! Sorry it came out dry. I appreciate your feedback very much. No matter how many times you test a recipe, variables can always come into play. One other idea I have toyed with is baking it with the cover on until near the end and then uncovering it to crisp up the top. Might retain more juiciness. Chag Sameach and thanks again for the feedback. Hi Carrie – I would go with Granny Smith, Fuji, or blush or a combo – sweet/tart/crunchy. Let me know how it comes out and if you have any more questions! 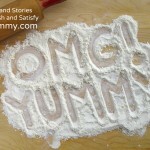 I absolutely love that a reader sent you a recipe! How fun! And I love that you were able to take bits and pieces of one of your favorites and bits of her recipe and make something fun and new! The applesauce and flax subs are great too. I can imagine that add a lot to the flavor and nutrition. I am not Jewish, but have been wanting to do a Passover meal anyway. I will have to add this to my must try list! thanks for stopping by Carlee! 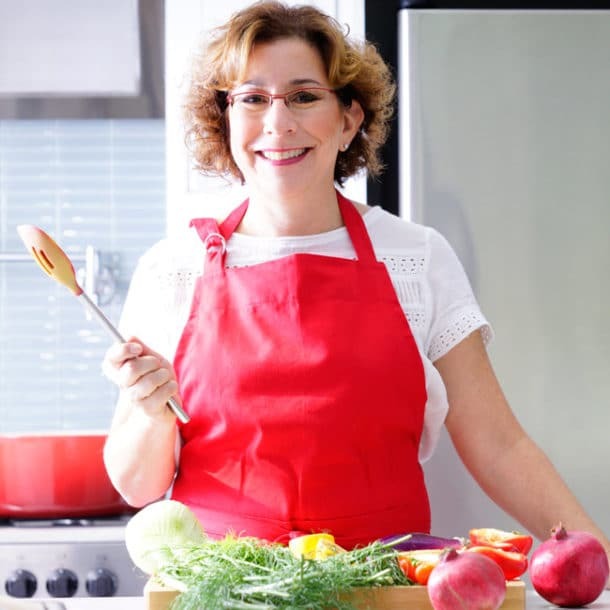 You should definitely do a Passover dinner next year – it is always always fun to have everyone participate in the meal and for the food to be symbolic of the key parts of the story. If you need any help with menu planning – you know where to find me. I’d love to help. Hi Jael. Great! Let me know what you think! I just made it again yesterday and my friend loved it. It’s a bit of work to put together (not hard just takes a bit of time) but it makes for a tasty result. I think it’s worth the effort. Happy Passover! I’m so going to make this! sounds so good with the dried apricots and contrasting textures. Thanks! I hope you like it! Let me know. Are you hosting at home?